Fatale Number #9 – Oh Josie! Why do you do this to me? Ed Brubaker has had immense success at the big two but he has always enjoyed doing his creator owned Criminal series of books. They are an underworld, film noir, pulp hero themed stories and have been very well received. Certainly a stark contrast to his work on Captain America and Daredevil to say the least! Sean Philips has been his right hand man and has a gothic style of his own that bring these seedy, dirty, grimy characters to life. They are a partnership well practised and have honed their skills to put out eight unique story arcs. The last couple of books have focused more on characters with arcane powers and Fatale has taken this to a new horrific direction. This issue is midway through a second Fatale arc revolving around Josephine; an immensely attractive, alluring and ageless femme fatale. In fact we do not know much about her at all, after nine issues! We are now enthralled in a story set in 1978 with a B movie actor called Miles and his friend Suzy. They have come across a videotape of satanic ritualistic sexual material are being chased by cult gangsters and find themselves at Josephine’s doorstep. Both are slowly realising what they have let themselves in for. Ed Brubaker uses narration to supplement the story and is a technique well utilised. It allows events to be drawn and described but remains silent when dialogue is being played out. It enhances the mystery of Josephine and the story itself whilst not being domineering. Otherwise the book is not dialogue heavy and events are shown more than told which is one of the keys to Brubaker and Phillips work. The pencilling and shading is dark and heavy and really suited to the dark night scenes. The bright colours of the day scenes are stunted to keep the fear alive and there are graphic scenes of blood and violence, which suit the horror motif perfectly. The book itself makes you feel uncomfortable and on edge as the suspense is built brilliantly. However Josephine is always beautiful and innocent as the art draws you in as much as the story itself. The theme of the book is unique to current comics and there is little other work like this out there. The gruesome cult horror angle added to the underworld scene fits perfectly and Sean Phillips escalates his artwork. It is an engrossing story because Josephine is a great character and you cannot help but be drawn to her, as all the men in the book are. They almost always meet with disastrous consequences but she feels for each of them. It is almost as if she does not know herself why she never grows old or why people around her often die. It adds to her intrigue and apparent naivety, which is part of her appeal. In fact at the beginning of the arc she is living on her own in Beverly Hills and rarely ventured into the city. She is sad and regretful of her past and her powers and when another man enters her life, she tries once again to escape her destiny. My main criticism may be one of my own personal failings with patience. I want to know what it is about Josephine’s power and I want to know now! 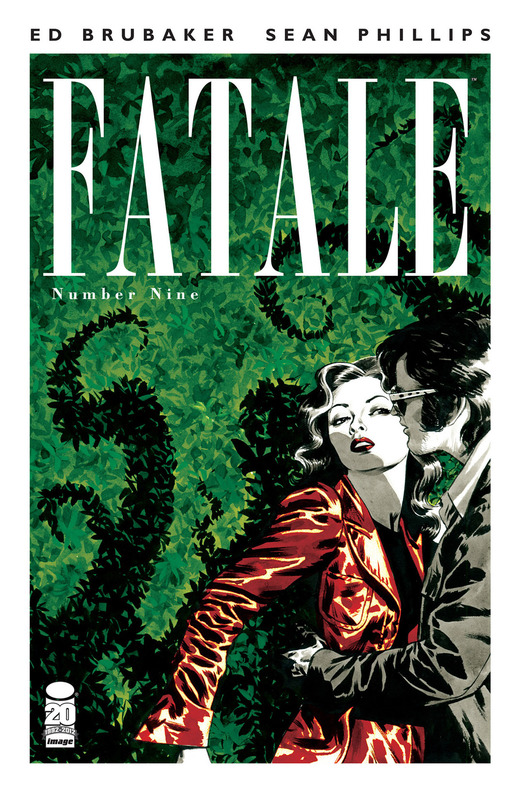 Fatale is an excellent book with brilliant story telling and art, which builds aching suspense about a girl we all love.